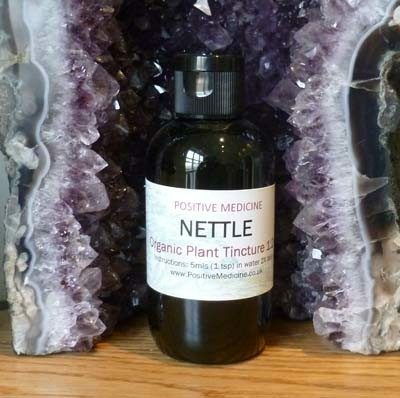 Nettle tincture has a reputation for increasing the elimination of gravel and waste material from the body. Notes: Nettle is super rich in nutrients and used as part of a treatment plan in anaemia, hair loss, arthritis, gout, hay-fever, allergies and skin irritations, itching and to increase milk production in nursing mothers. Nettle tincture stimulates the removal of uric acid from the system, thereby relieving arthritic & gout conditions. Nettle has a high iron content which is bio-available so can be used as good general tonic and is particularly useful in recovery from anaemia or after heavy menstrual flow. Nettle has bio-available silica so good for connective tissue healing and regeneration. Has powerful anti-allergenic properties so useful in allergic histamine reactions & hay fever and is traditionally combined with Elderflower for this purpose. Also useful as part of a treatment in eczema, acne & psoriasis. Good for hair and nails. Nettle has proved a wonderful tonic for exhausted, anaemic new mothers; it feeds the system and increases the quality and quantity of the milk. Stinging nettle rates alongside Dandelion as one of our best native detoxifying herbs. It is nutritive and rich in minerals, particularly iron and potassium: Cooked like spinach, with a little dab of butter and twist of mixed peppers it makes a delightful Spring vegetable. Dose: 5mls in water 3 x daily. History: Nettle is mentioned by Hippocrates and Dioscorides Samuel Pepys, in 1661, wrote of having a dish of nettle porridge. Around the same time cottagers made nettle beer as a country remedy for rheumatism and gout. Science: A study of Urtica by German scientists, Riehemann, Behnke and Schulze-Osthoff was published in 1998 that demonstrated an inhibitory effect on inflammatory processes in rheumatoid arthritis.